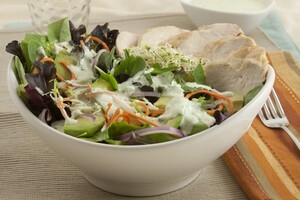 In large bowl add Ranch Dressing packet (3.2 oz) to buttermilk. Mix well with wire whisk or electric mixer at low speed. Blend cilantro and lime juice in a food processor until pureed. This will give the dressing a light green color. Add to ranch and mix at low speed until combined. NOTE: This dressing can be made "light" or "fat free" by substituting 3 qts. buttermilk and 1 qt. light or fat free mayonnaise.